Who wants to visit the awesome worlds in fantasy anime?! (Cue the slow hand raise) From MMORPG alternate realities to a world where life is determined by games, here’s our top 6 list of anime fantasy worlds that would totally be worth the trip! Let’s think of the many perks in the World of Elder Tales: armor and clothing that never seems to get dirty, tangible magic powers, superhuman physical abilities, adorable calculating megane (glasses) characters, etc. The world itself is built in a near geographic parallel to the real world, so it’s like living in our world, but much cooler. The Special Region in GATE is (as far as we can tell) ruled by a totalitarian, Roman-esque Empire, but the real reason to visit would be to live out all of your semi-realistic otaku dreams. Do you like elves? Got it. Gothic lolitas? Sure. Girls with cat ears dressed as maids? Way ahead of you. The Special Region fulfills your otaku dreams without even trying to. They all just live there. Also, there are dragons, which is a must-have in most fantasy anime worlds. The massive spacefaring ship may not seem like an ideal place to visit at first, but Sidonia is not without its own unique beauty. When they aren’t under attack by Wellsian horrors from the depths of space, the denizens of Sidonia reside in the towering, hive-like columns of vertical buildings. This sprawling, labyrinthine architecture would certainly be a sight to behold in person, second only to the lovely view one gets in the observation bubbles that travel through the self-contained ocean. Honestly, who hasn’t dreamed of living on a giant space ship and fighting aliens? The protagonist in Is it Wrong to Try to Pick Up Girls in a Dungeon?, aka Danmachi, makes a living going into a dungeon and harvesting monster cores for money. In other words, you’d be living in a real-life MMORPG. The world centers around Babel, but the sprawling city around it is reminiscent of a thriving Dark Ages marketplace. On top of that, there are gods everywhere. You might be able to catch a drink with Hestia, Loki, Ganesh, or Hermes! Little Garden from Problem Children Are Coming From Another World, Aren’t They? It’s always nice to be able to win riches and fame from combat. It’s like getting a salary for being awesome, right? Little Garden is an anime fantasy world where you use your “Gifts” to battle in high-stakes Gift Games. Winners earn money and other rewards! Also, there are griffons, spirits, gods, and other fun new species to meet and (maybe) get along with. Speaking of quick cash, imagine a world where everything is decided by games. Literally! Disboard from No Game, No Life is ruled by Tet, the God of Play. Under his rule, the many races of Disboard live together in “peace.” (Seriously, murder and theft are outlawed.) Everything from loyalties to the sovereignty of an entire nation is decided by your ability to win games, which can include anything from Rock-Paper-Scissors to card games. Not all fantasy anime worlds are tangible. Some of the best ones originate in the minds of our favorite main characters. Rikka, from Love, Chunibiyo, and Other Delusions, is a special case. Even as a high school student, she still entertains her grandiose middle school mental fantasies, and what happens in her brain is all kinds of special. Hint: everything hits the fan when she starts yelling her transformation incantation. We’d love to visit with her inside her imagination to see where she’d take us.. 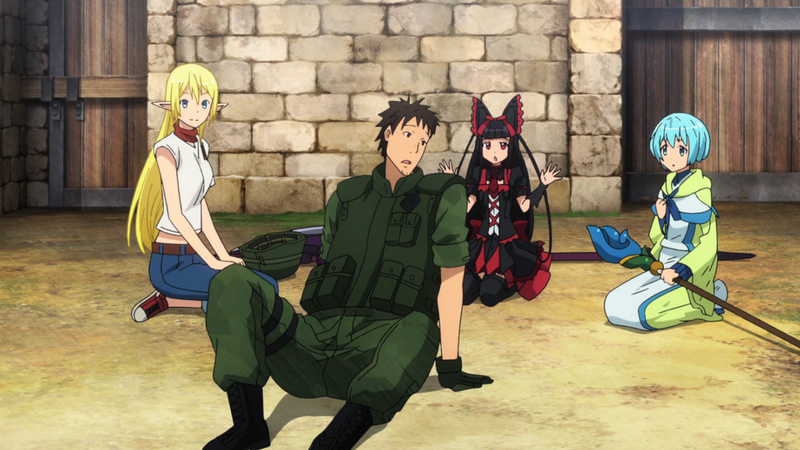 If you were allowed to visit your favorite fantasy anime world, where would you go? SO MANY CHOICES! Let us know on Facebook, Tumblr, or Twitter!